Fashions change, pop-culture evolves, but cool is timeless. That is the founding principle behind the Bell Bullitt helmet. Designed in the image of the original Bell Star helmet, it has been updated for fit, comfort, functionality, and safety. Yet the classic soul remains. 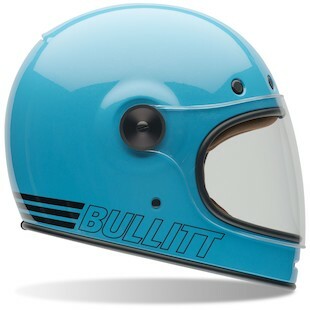 With the new Bell Bullitt Retro Helmet, the vintage feel of the helmet itself is augmented with a teal color scheme throughout. There is no mistaking this lid for anything other than exactly what it is… an awesome throwback to a bygone, and really fly era! Constructed of an ultra low-profile fiber composite shell, and equipped with a removable, washable, anti-bacterial interior liner, this helmet has everything you need to enjoy riding in 2014, with the inherent coolness of the 1960s. 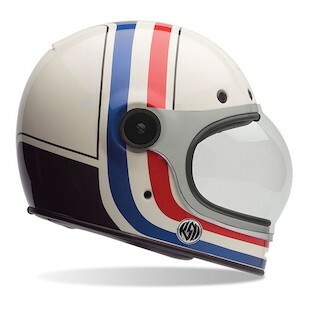 From the mind and design studio of the contemporary king of classic style, the Bell Bullitt RSD Viva Helmet draws on the skills of Roland Sands to offer a unique take on the hugely popular helmet. A white/red/blue color scheme screams of old-school Americana and is set off by the bubble shield that ships with the helmet (as opposed to the standard flat shield). When you hand the process over to one of the best in the business, you tend to arrive at the intersection of great design and amazing detail, and the RSD Viva helmet is no different. For riders looking to make the most out of their vintage bikes, jackets, drag bars, and daydreams, few helmets offer the combination of style and protection as the Bullitt and the rest of the 2015 Bell Helmet Collection.